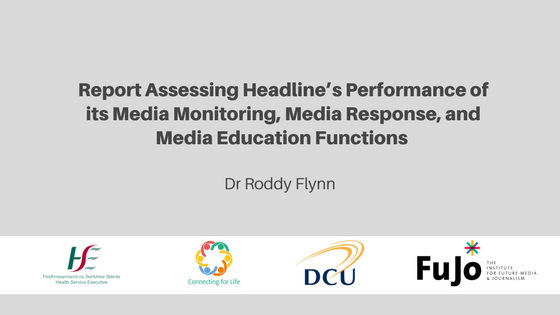 In March 2017, a team led by Dr Roddy Flynn of the Institute for Future Journalism and Media (FuJo) and DCU School of Communications made a successful bid to the HSE’s National Office for Suicide Prevention (NOSP) to survey and analyse the operations of Headline, which monitors mental health and suicide reporting in Irish media. The success of Headline’s training/education work. This work was conducted using a mix of methods including assessment of the workings and layout of the Headline website; assessment of the content analysis protocols used in media monitoring; and interviews with stakeholders in the Mental Health and Suicide sector, working journalists, journalist educators, the National Union of Journalists (NUJ) and print and broadcast regulatory bodies in Ireland. The report makes recommendations in relation to media monitoring, responding to guideline breaches, and education and training. In particular, the researchers recommend that the tasks of media monitoring and guideline breach identification are outsourced to allow Headline staff greater capacity to engage in media response and education activities. This would further enable Headline to engage with a wider set of media institutions and to deepen existing relationships.